It’s been a while since my last shirt design, but I think I have something that you will all like! 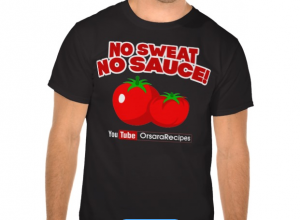 The shirt is inspired by a quote I said in my tomato sauce video, I say “No Sweat, No Sauce!” It’s true, if you don’t work hard for the things that you want, you will never succeed. This goes for everything in life. I hope you like these shirts! If you purchase before May 4th, you will get 30% off of your order! 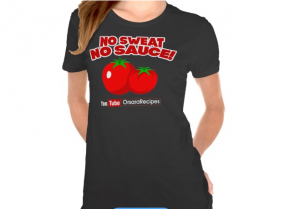 Just use the code (MOMMYIOUSALE) during checkout. Also, stay tuned for tonight, I will be uploading my video with Johnny Meatballs! 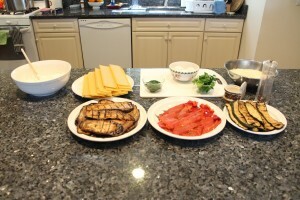 The recipe I would like to share with you today is Vegetable Lasagna. Lets get started!